How, oh how, did it take us so long to realize the wonders of this culinary marriage? Our first stop in Istanbul had introduced us to the wonders of fresh honey – breakfast each day at the hotel supplied fresh honeycomb, which we liberally spread on, well, everything – but Greece made us realize what it means to spread that honey all over some smooth, rich, yogurt. Our first day in Santorini, we walked into Oia and hopped into a cute cafe. Our honey love having been born only a few days before, M opted for the “yogurt and honey” for 4.5 euros. 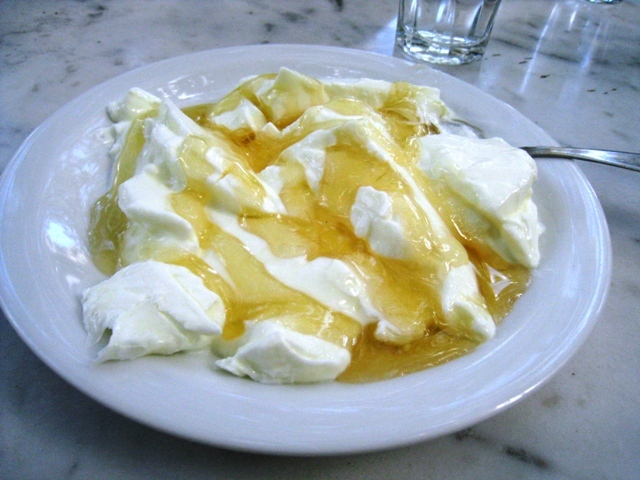 What came out was nearly a meal – a large bowl of Greek yogurt drowning in honey. This quickly became our newest obsession: we scoured the island, and the rest of Greece frankly, for versions of this culinary delicacy. Both of our hotels in Santorini had great versions, but Crete took things to another level. The small town of Vrysses, in central-west Crete, is famous around the island, and most of Greece, for the honey produced there, as well as the yogurt that goes with it. Driving into the small town square, the central fountain plaza is surrounded by honey shops. With no info to make a decision, we opted for the one that looked the most family-run: Kaprri. We ordered two plates – not bowls here, as they usually come – and we quickly caught on to what makes Vrysses honey so distinctive. The yogurt was approaching the consistency and flavor of sour cream, which was paired with a light clover honey, a wonderful complement that reduced a lot of the overpowering sugary sweetness that we usually associate with yogurt and honey. 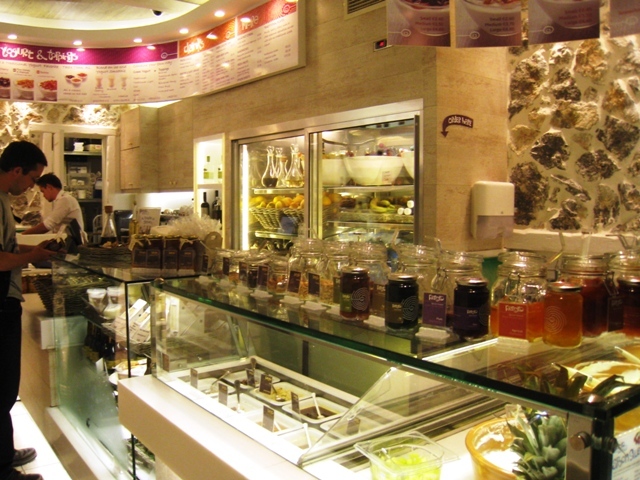 In Athens, we were fortunate enough to discover a yogurt and honey BAR, Fresko – yes! – located just outside the spectacular new Acropolis Museum (Fresko, Dionysiou Areopagitou 3, Athens 11742, Greece). Notice: we need this place in the United States. Six kinds of yogurt, two kinds of honey, plus an assortment of smoothies and other drinks. M nearly died and went to heaven, savoring both some honey and a pomegranate smoothie while there. Back in the USA, we’ve been getting more into the yogurt and honey scene around us. Our favorite brand of Greek yogurt – which we were happy to find also for sale in Lisbon – is Fage. We’ve been buying a four-pack almost weekly, and pairing it with locally-produced honeys at breakfast. Chicago has a great honey collective for those of you around town, the Chicago Honey Co-op.